Falafelkid.com: ´ Shenmue´ to hit Wii? 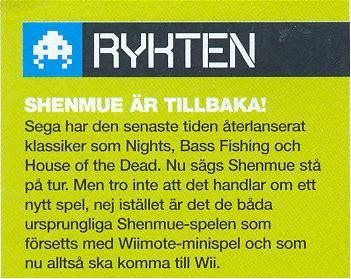 Sega will port both parts of ´Shenmue´ to Wii, Swedish gaming magazine Gamereactor claims, according to GameFAQs forum user Saikobooru. He posted a scan from the magazine. Sega has rereleased classics like Nights,Bass Fishing and House of the Dead lately. Now it's said that Shenmue is next. But don't think that it's about a new game, instead, they're bringing back the two original Shenmue games with extra Wiimote-minigames which will be released for the Wii. The controversial (at least in my book) Surfer Girl had posted rumours to the same effect. However, it was simply a matter of time before Sega would bring the financial flop that was ´Shenmue´, while undoubtedly being one of the most influential videogames ever, to another console. 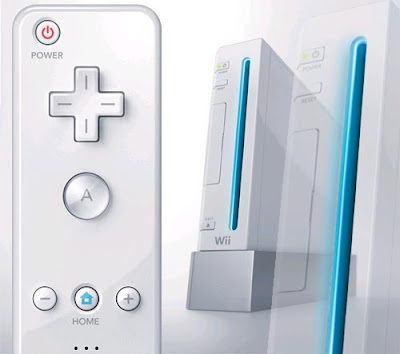 Wii, as the market leader worldwide, would be the natural choice. The only question is whether Sega will simply port the first two games over as they did for ´House of the Dead´ or whether they are also considering ending the series with a brand new ´Shenmue 3´. EDIT I have just been on the phone to the author of this article and he gave me a little more detail. He heard the rumour from a Dutch game editor when he was at an event in the United States and is unsure whether that person had heard it from a direct source. He himself rates the rumour as unreliable. yoyo whats up this is the IALS once again life and direct from planet mr falafel the voice of the electronicunderground!! - For starters I have to admit, GTA4 is quite okay actually...it's not super-perfect or something but it's good it's entertaining. It doesnt'r deserve the ridiculously high ratings though since the core gaemplay simply can't match the gorgeous presentation. But it is a lot tighter than the old GTAs as far as the gameplay mechanics are concerned. Also Niko must be one of the coolest cats to appear in a video game since I don't know ;-)Wouldn't suprise me if rockstar used him for the sequel. and Brucie is hilarious you must check his website it made me lol to the fullest. - I am not terribly impressed by Mad World. I don't know whether it's supposed to be a parody of a mad society that loves violence or whatever but if it's not it's just a sad reflection of it. I don't support mindless violence that tries to compensate for lack of gameplay ideas. where the transition between gameplay to cinematics becomes more and more seamless better and more exciting stories are getting told and that will eventually draw in more and more people. At the end of the day videogames are without a doubt the most complete package combining many stand alone aspects from other mediums like text,visuals,interactivity, art and music. - Let's face it: The Conduit looks like a super-duper-high-end-Half life1-2turbo-deluxe-mod-on-steroids to me if that makes any sense. If it ends up looking at least as good as Half Life 2 I might consider buying it. The art style or lack therefore and low polyness of everything needs to be addressed.Let's face it It doesn't look good enough for a 2008 Wii fps. Wii owners should demand more. - The IGN Wii boards don't accept any negativity so beware. You will get banned for critisism no matter how constructive it is. - I haven't seen a Wii game screenshot that made me say wow since Fatal Frame. - I wonder what's the status of Red Steel 2? Can't wait for the first shots. I'm counting on Ubi Soft this time around. It's been in development for quite some time so it should be polished by the time when first shots will surface unlike Conduit I should add ;-). I'm positive they will nail the controlls this time around and round it off with a great visual presentation. A shenmue compilation for Wii is actually the best news I 've heard for a long time.Words won't do justice for how much I love this franchise and I am a die-hard Nintendo fan. But I don't know if we can trust the source of these news.How reliable can be a swedish magazine? Can you investigate on the subject? Finally,congratulations for your site but I miss your frequent updates. Please update more often,or at least post more on the comments. Shenmue Wii would give me reason to finally retire the Dreamcast (Well, Shenmue, Sakura Taisen, and an AFFORDABLE copy of Marvel vs. Capcom 2 on another platform ;) ). However, I do have to wonder if they WOULD bring the sequel to Wii, or if they'd pull a carrot-and-stick stunt like some developerss are trying. One thing's certain, though... Shenmue would benefit more from a retouch, even if it is just minor visual upgrades. The original releases of the games look VERY dated in comparison to today's games. It may be old news, but this is a SPECULATION site. As in rumors, whisperings, etc. This is a big rumor that's been quite persistent, so it obviously warrants discussion. you should start your own blog, wiiboy. just make sure it does RSS feeds, and i'd read it every single day. your rants are priceless, hilarious, and mostly quite true. your grammar is bad, but you articulate fairly well. you comment on other blogs all the time: start your own. also: you should start commenting on joystiq, wiiboy. it'll definitely be good for a laugh. soooo many ignorant ps3 fanboys over there. it'd be a riot. "blaba transistor blabla bandwith bla bla custop babla filrate blablablablabla"
and that's why Conduit looks like ancient shit64 bs because of all that high end stuff that you list!?! Sean Malstrom expDiablo 3 Goldlains it more smoothly when compared with My partner and i in his articles or blog posts on the web site, nevertheless I'm sure you get the idea. Since a person you actually addresses the market, precisely what are you will be feelings? I have implemented your site considering that prior to Nintendo wii release and also have Guild Wars 2 Goldgenuinely liked your content, keep it up.